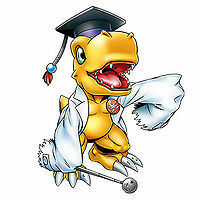 A genius Agumon that has a doctorate in Digital Monster studies from Digital World University. 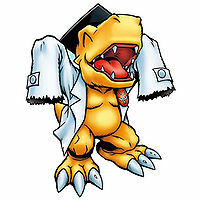 The badge on its chest is proof of its doctorate. Though it is said that its degree was created by Agumon Hakase itself, it certainly is knowledgeable about Digimon types and territories. Due to its peculiar accent in which it attaches "Gya" to the end of its remarks, it is thought to possibly have come from a distant locale. 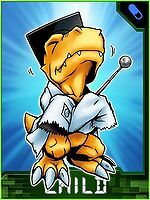 Its Special Moves are to try to enchant itself with cleverness through its hat (Hakase Bou), and try to persuade the opponent with its rod (Hakase Bō). 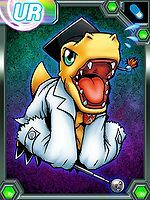 Hakase 「博士」 means "Professor" or "Doctor"
[N 2] Professor Hat ハカセボウ N/A Uses its hat to enchant itself with cleverness. 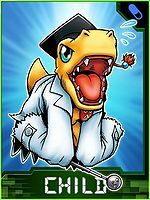 [N 3] Professor Rod ハカセボー N/A Uses its stick to persuade the enemy. ベビーフレイム Bebī Fureimu Spits fire out of its mouth. 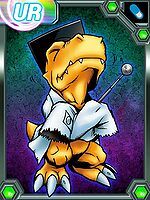 Surudoi Tsume  Sharp Claw するどいツメ N/A Uses its claws to rend the opponent. 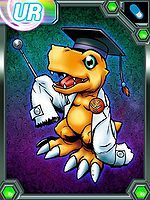 Agumon Hakase can only be obtained as a collectible card. 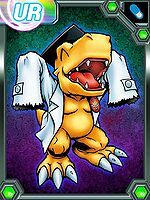 Its card is part of the Agumon Eight (アグモンエイト Agumon Eito) set and the Digimon Professor (デジモン大学生 Dejimon Daigakusei) set. 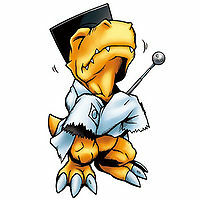 An icon of Agumon Hakase appears in the main menu. 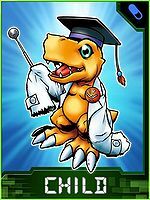 Agumon Hakase is available as a Digimon Medal. 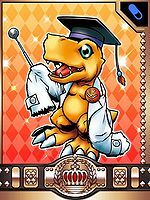 Agumon Hakase is available as a Digimon Card. 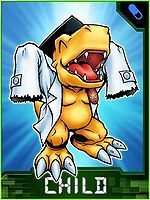 In Digivice iC 20x, Agumon Hakase was listed as a Reptile type. It can evolve to all the Adult Digimon in this V-Pet. 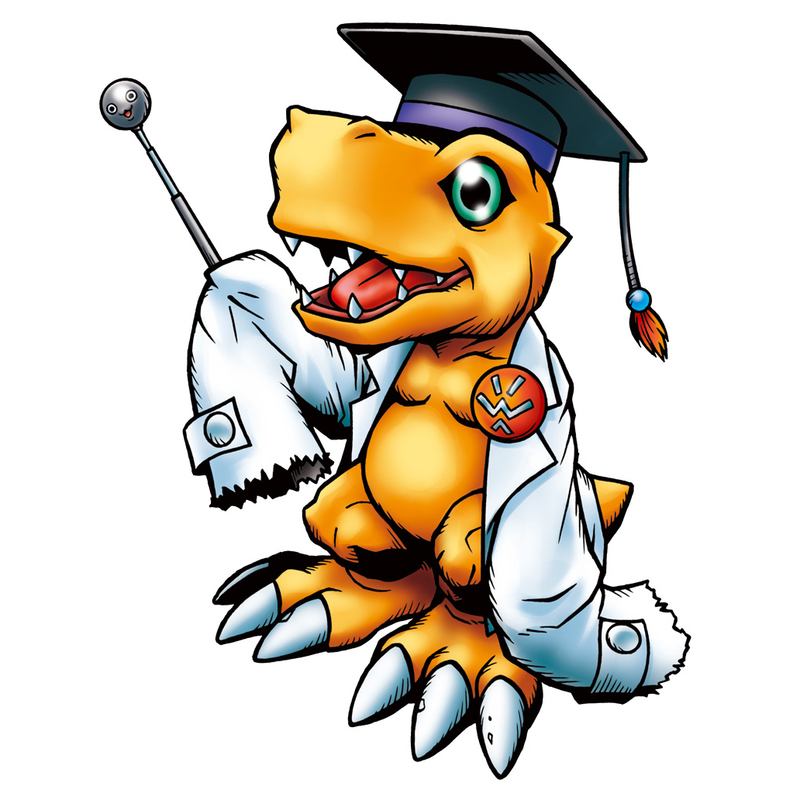 In Digimon Twin, Agumon Hakase was listed as a Child and as a Dinosaur type. 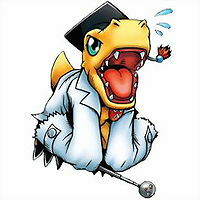 ↑ The Digimoji on its badge reads (デ), possibly from デジモン (Digimon). ↑ The "bou" (帽) in Hakase Bou (博士帽) means hat and is a reference to a mortarboard/academic cap. ↑ The "bō" in Hakase Bō (博士棒) is homophonic to "bou" (棒) which in this case means rod; stick, probably written this way to distinguish between the two. This page was last modified on 18 December 2018, at 23:51.